While the southern suburbs of Boston are to bar pizza what the northern suburbs are to roast beef and seafood joints, not all bar pies are the same. Anyone who regularly gets pizza from the Poopsie's in Pembroke and the Lynwood Cafe in Randolph realizes that there are subtle (and sometimes not-so-subtle) difference between the bar pizzas that are served in the cities and towns south of Boston. But there is one spot in Abington called Spencer's that serves up bar pie that tastes awfully similar to that of the Lynwood, which many consider to be the cream of the crop. So is Spencer's equal to the Lynwood? Well, we will simply say that if you love the Lynwood Cafe's pizza, you will probably not be disappointed by the pies at Spencer's. Like so many restaurants and bars that feature bar pizza, Spencer's will never be mistaken for a high-end bistro in Boston's South End. Indeed, driving by the place, which is a short distance from two other towns known for their bar pie (Whitman and Rockland), one might question even walking into the eatery, as it is housed in what looks like an aging factory/warehouse building with a dusty parking lot out front and plenty of neon in the windows. To some, it may be difficult to even know what Spencer's is from the outside. Is it a scary dive bar? Not even close. A basic sub shop? Not really, but definitely closer to that than a dive. A sit-down restaurant? 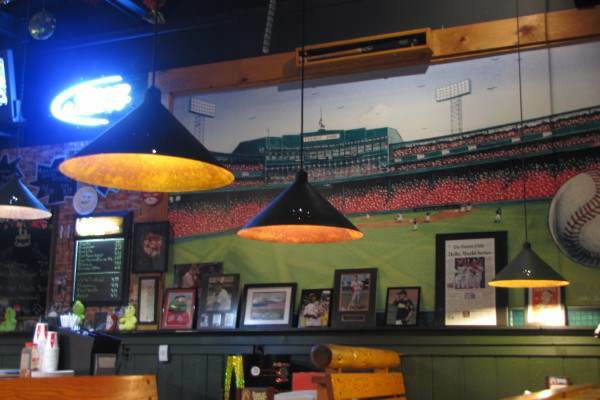 Well, yes, in a way, as it has three rows of seating (including booths along the front and back walls), hanging lights that give the place more atmosphere than your typical sub shop with too-bright fluorescent lighting, and lots of Red Sox (and some Celtics) memorabilia on the walls. The counter/ordering area by the entrance certainly does have a sub shop feel to it, but Spencer's feels somewhat more comfortable and more of a place to linger than your standard House of Pizza. Of course, one of the main things that differentiates Spencer's from your standard House of Pizza is its tremendous bar pizza (including pepperoni pizza, linguica pizza, anchovy pizza, bacon pizza, mushroom pizza, salami pizza, and much more), which, as mentioned earlier, tastes very much like that of the Lynwood. (One of the best options is a rather salty but outstanding bacon and feta pizza.) The individual-sized pies have the same thin and slightly chalky crust that the Randolph landmark has, and the rich and deep-tasting sauce towers over some of the rather tasteless sauces that often diminish other bar pies. Add a slightly bitter and greasy mix of cheeses to the top (which extend to the edge of the crust) and just the right amount of salt and pepper and you have a pizza that ranks right up there with the Lynwood's as well as some of the other top bar pies south of Boston. And for those who aren't looking for bar pizza, Spencer's has plenty of other items, including salads, steak tips, wings, calzones, gourmet pizzas (such as roasted chicken, primavera, and shrimp/garlic), and an array of wraps, hot subs, and cold subs. Beer is also offered here, though don't expect to find fine Belgian ales here--Spencer's is more of a Bud place. Spencer's Pizza may not have the name recognition of a Lynwood or a Town Spa (a well-known bar pizza spot in Stoughton), but its bar pies can surely be considered at or near the top of the heap. It may look a bit sad from the outside, but this little eatery near the center of Abington will make many, if not most bar pizza lovers extremely happy once they try the wonderful pies here. Copyright © 2011-2014, Boston's Hidden Restaurants (www.hiddenboston.com).